Wang Jingqing is vice-president of the Chinese Academy of Social Sciences, deputy secretary of its leading Party members group (a ministerial post) and an alternate member of the 19th Central Committee of the Communist Party of China. He joined the Communist Party of China (CPC) in May 1975 and began his political career in June the same year. He was once a cadre at the Department of Higher Education under the Ministry of Education. Thereafter he became a deputy division chief and then division chief, and later deputy director and then director of the No.3 Bureau of Cadre Administration at the Organization Department of the CPC Central Committee. In July 2007, he served as Member of the Ministerial Affairs Committee and concurrently as director of the No. 1 Bureau of Cadre Administration at the Organization Department. 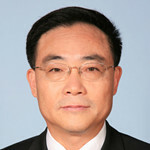 In Nov. 2011, he was appointed vice-minister of the Organization Department. He was transferred to CASS in March 2016.